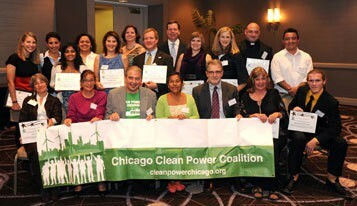 On September 20, 2012, the Illinois Environmental Council (IEC) gave its Leadership Award to the Chicago Clean Power Coalition for its work to close Chicago’s two coal-fired power plants. These plants were two of the dirtiest in the country, and called out by the NAACP in their report “Coal Blooded: Putting Profits Before People“ as two of the worst environmental justice offenders of all 431 coal plants surveyed in the country. Pam Richart, Eco-Justice Collaborative (EJC), and Christine Nannicelli, Sierra Club, accepted the award on behalf of the Coalition. EJC initiated the work that led to the creation of the coalition in 2010. The six initiating groups included: Little Village Environmental Justice Organization, Pilsen Environmental Rights and Reform Organization, Environmental Law and Policy Center, Respiratory Health Association of Metropolitan Chicago, Sierra Club, and Eco-Justice Collaborative. 49th Ward Alderman Joe Moore, known for his independent stance on environmental and social justice concerns, partnered with the coalition from its inception. Together, the initiating groups and Alderman Moore drafted the Clean Power Ordinance, which was introduced to Chicago’s City Council in 2010. This Ordinance required Fisk and Crawford to be cleaned up or shut down. Over the course of the campaign, the coalition grew from six initiating groups to more than 60 organizations, which included business, faith, environmental, and student leaders. More than 20 of these were active in planning and carrying out the campaign. After 2 1/2 years of successful organizing, the plants ceased operation early September 2012. Take Coal Ash Out of the Military Budget!